With over 70 years of experience, there is no one better than Booth Movers to handle the details of your next residential or commercial relocation. Moving can be a stressful process, and working with a qualified team of northern New Jersey movers can make all of the difference! Our northern New Jersey moving company is BBB-accredited with an A+ rating and is ProMover-certified through the American Moving & Storage Association. We are also a long-time board member of the New Jersey Warehousemen & Movers Association, demonstrating our commitment to professionalism within the industry. With expert care and efficient New Jersey moving services, we guarantee that your next relocation will exceed your expectations! Our award-winning northern New Jersey movers are committed to quality and will guide you through each stage of the moving process. With free, on-site estimates and the most highly trained staff in the industry, you can’t go wrong with Booth Movers! Our northern New Jersey moving company is also a trusted agent of Atlas Van Lines and, as such, we have access to a global network of resources to handle any relocation with ease! See our service area directory below to learn more about the northern New Jersey moving services we proudly provide to the areas listed. Bergen County – Booth Movers is the premier choice among northern New Jersey moving companies serving the Bergen County region. Ridgewood – For all of your Ridgewood moving needs, Booth Movers has got you covered with our customizable northern New Jersey moving services! Wyckoff – Let Booth Movers assist you with your Wyckoff relocation for a seamless moving experience. Tenafly – As the first choice among New Jersey movers, Booth Movers can help you with local or long-distance moves in Tenafly. Ramsey – Our experienced team of professional movers has the expertise to handle any relocation in Ramsey. Mahwah – Our Mahwah movers are experienced in all facets of a local and long-distance relocation. Paramus – Booth Movers is the first choice for professional, quality moving service in the Paramus area. Teaneck – When you need a Teaneck moving company you can trust, there is no better choice than the experts at Booth Movers! Fair Lawn – Our northern New Jersey movers have the equipment and expertise to take the stress out of your Fairlawn relocation. 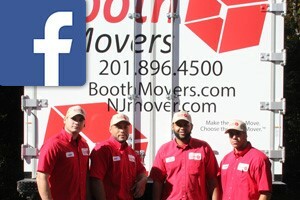 Hoboken – You can’t go wrong with having Booth Movers manage your relocation in Hoboken! Edgewater – From start to finish, our northern New Jersey moving company will exceed your expectations. Fort Lee – Proudly serving the Fort Lee area since the 1940s, Booth Movers offers comprehensive moving services for relocations big or small. Englewood – Whether moving down the street or across the country, let our northern New Jersey movers handle the details of your Englewood move! Westwood – Booth Movers offers customizable Westwood moving services to suit the unique needs of your relocation. Closter – Our northern New Jersey movers are dedicated to making your next move in Closter an exceptional experience! Hudson County - Named after Henry Hudson, a famous sea captain from the 1600’s, Hudson County, New Jersey combines a rich historical past with a thriving modern economy. Passaic County - Considered part of the New York metropolitan area, Passaic County, New Jersey has a great deal to offer its residents. Saddle River - When planning your Saddle River relocation, Booth Movers will guide you each step of the way for a seamless moving experience you can trust. Moonachie - Booth Movers is a full-service Moonachie moving company for local and long-distance moving needs. Fair Lawn - Fair Lawn has many entries on the National Register of Historic Places, and it is home to charming communities. Franklin Lake - Franklin Lakes, one of America’s most expensive zip codes according to Forbes, is home to stunning homes and the beautiful Franklin Lakes Nature Preserve. Garfield - Formerly known as East Passaic, Garfield, New Jersey was named for the 20th President, James Garfield. Hackensack - Hackensack has a long, rich history that includes George Washington being headquartered in the city during the Revolutionary War. Park Ridge - Park Ridge is a charming bedroom community dotted with historic homes and family-oriented neighborhoods. Getting started with Booth Movers couldn’t be easier! Just give our professional northern New Jersey moving company a call today, or fill out our simple online form to connect with a friendly team member and request your free, no-obligation estimate!